Whenever we install a program on our laptop or computer it creates its shortcuts during the installation process. Sometimes a program prompts us to check the places where we want these shortcuts to be created however some programs don’t do that and simply create shortcuts at the desktop and other such frequently visited areas of our computer. These shortcuts grab a lot of visible space on our desktop. A time comes when accumulation of multiple shortcuts makes it difficult for us to find out those icons which are a part of our daily usage. In such situations it becomes necessary to clean our computer from extra shortcuts to make it easy to work on it and also improve the performance of our machine. Any effective shortcut fixer software might come handy in such situation as it can assist us in getting rid of all those shortcuts that are cluttering on our computer without doing any good for us. Let’s take a look at some of the best shortcut fixer software for Windows operating system and see which one is the best fit for freeing your computer from unnecessary shortcuts. Free Shortcut Remover is a small utility that is specially designed to remove the inadequate shortcuts from your computer. You can download and install it for free. It has got the ability to point out all the shortcuts that are worth removing. Once Free Shortcut Remover has logged all the broken, inactive and useless shortcuts you can free your computer from them with the help of a single click. 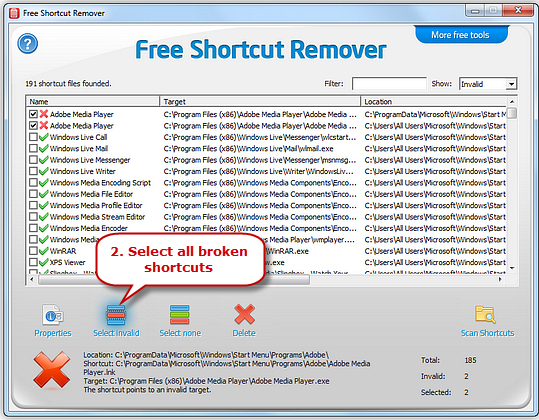 Free Shortcut Remover works on all the commonly used Windows operating systems. It has got some other exciting features and applications that add to its value. Let’s make you familiar with how to use it in below-mentioned steps. 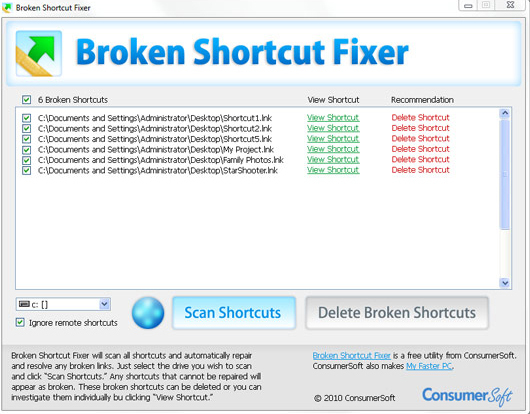 Broken Shortcut Fixer allows you to scan the shortcuts present on your PC and presents you with a list of problematic shortcuts that you can either repair with the Broken Shortcut Fixer or simply delete them otherwise. 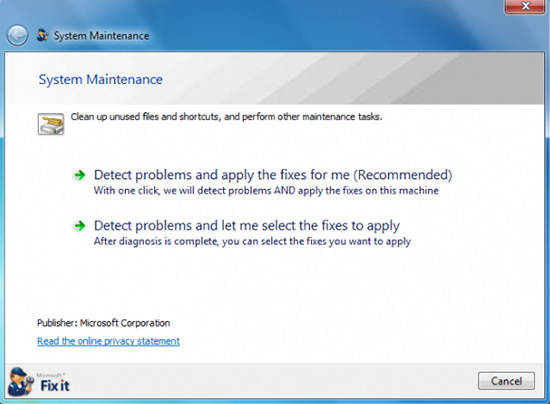 Its repair operations are based on Windows link resolve method. By selecting to delete the selected shortcuts, all the problematic shortcuts are sent to the Recycle Bin. Below-mentioned image shows the graphical user interface of Broken Shortcut Fixer. 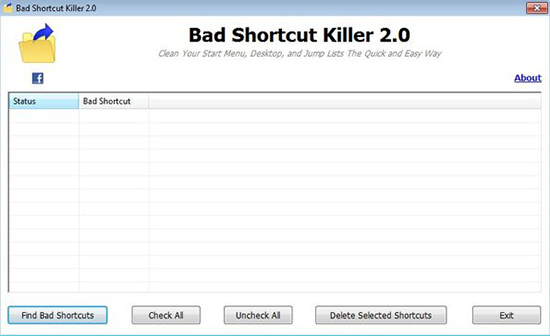 Bad Shortcut Killer is also an amazing utility that allows the users to delete the useless shortcuts clogged on the desktop or consuming space in the “Start Menu” pane. 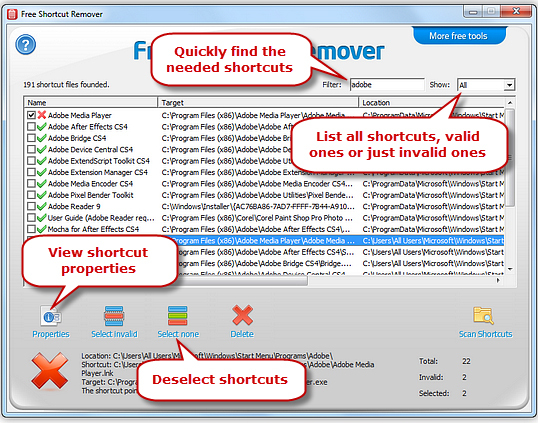 Similar to its counterparts this Shortcut Fixer Software also allows you to manage the shortcuts on your machine by listing them and pointing out the broken ones among them so that you may verify them from the list and remove them altogether. Users with operating system Windows XP, Vista or 7 can use this software. We are sharing an image of its graphical user interface to give you an idea how it will look once you have got it installed on your PC. It works on almost all the versions of Windows OS. Then press Enter to access it. If you are using an older version of Windows then you may follow the below-mentioned link to Microsoft Support and get your computer cleaned from unnecessary shortcuts that are of no use to you. As shown in the picture, the Microsoft Fix it will do its best to free up your storage from unused and invalid shortcuts. 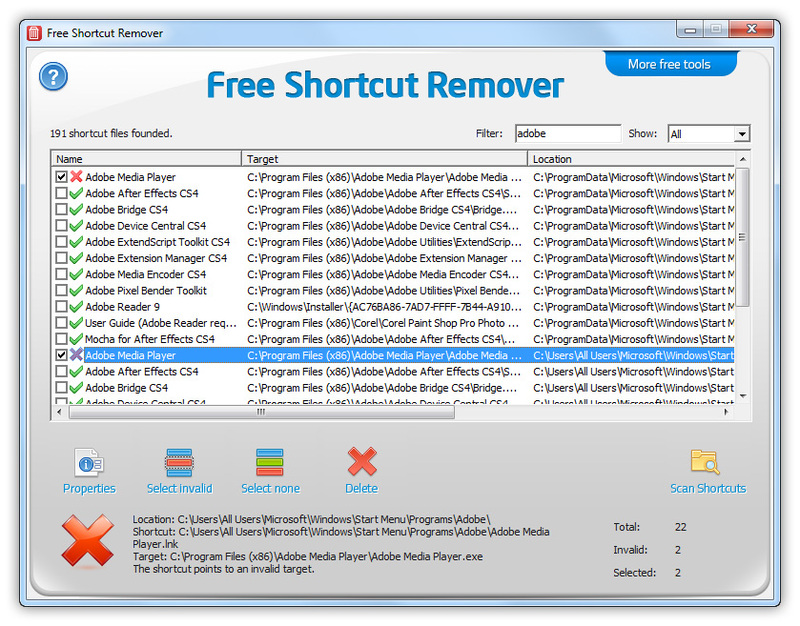 There are many shortcut fixer software solutions available for handling the unwanted shortcuts however as per our recommendation Free Shortcut Remover is the safest and fastest utility for getting rid of unnecessary shortcuts from your computer. It also allows deleting the icons made in the recent history of your media player or document software to ensure privacy. You don’t have to pay anything to get it and you can improve the performance and outlook of your computer with it without putting your machine on any risk. It is recommended to download it from the official website. When you open the Free Shortcut Remover after installing it on your PC you’ll see a button named “Scan Shortcuts” in the lower right corner of its graphical user interface. Clicking that button prompts you to choose a location, disk or directory that you want to scan for unwanted shortcuts. Select the location and click “OK” to proceed. 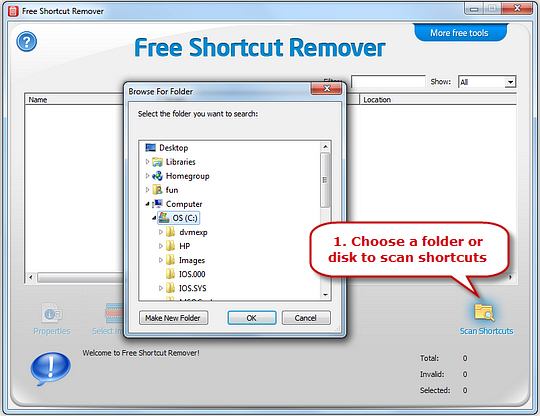 After execution of first step Free Shortcut Remover will show you the scanned shortcuts in the form of an interactive list that allows you to select the scanned results with the help of few buttons as shown in the below-mentioned image. 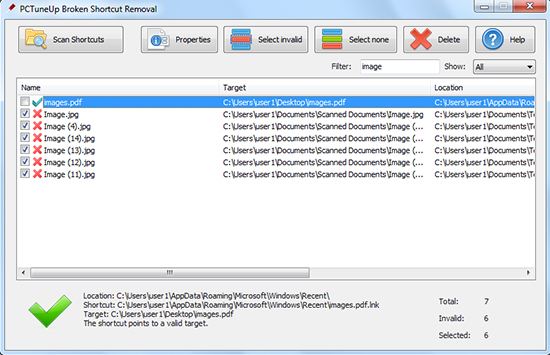 “Properties” button helps you to analyze the shortcuts before deleting them from your PC. “Select Invalid” button allow you to select the broken shortcuts with a single click. You can add more shortcuts to the selection by using “Select more” button. Once you are satisfied with the selected shortcuts, click the “Delete” button to wipe all those unnecessary shortcuts from your computer. You may refer to below-mentioned image for a quick understanding of all the basic functions of Free Shortcut Remover software.